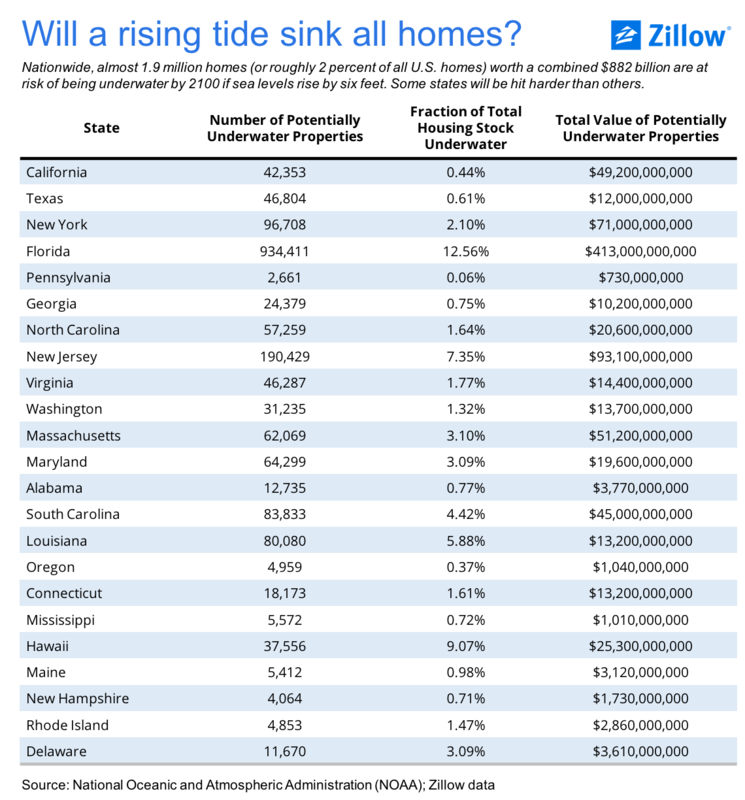 In US, homes at risk from climate change? Mary Meeker puts out a set of trends on the internet every year and I thought why not do one for sustainability and climate change. Here is the start to Weber’s Clean tech slides…These are in no particular order, as I update these slides as I come across new and interesting ones. I will add more as I become aware of them. This slide shown which I took from here and they aggregated from somewhere else. 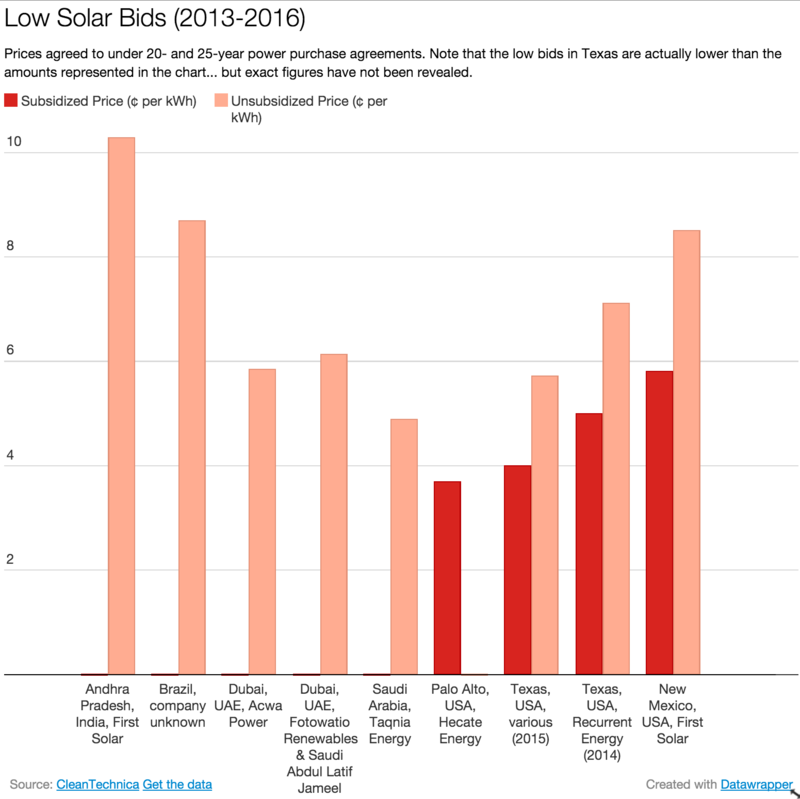 What is shows is the bidding by companies to provide solar electricity, the latest bid in the state of California is less than 4 cents per kwh for a 25 years of electricity. There are some subsidies included in this – in the US, the renewable energy tax credit and there is lots of discussion in the comments about the amount of the subsidy based and when the power is supposed to be delivered. 33% of electricity produced in the EU now comes from renewables, of which 18.5% is hydropower and 14.4% “other renewables” (mostly wind and solar power). In 2011 hydropower supplied 15.3% and other renewables just 9.3%. The share of fossil fuels has gone down from 48.6% in 2011 to 40.5% in 2014. Nuclear power has remained stable despite the German nuclear phase-out. Another interesting chart on energy efficiency and economic growth is posted here discussing how electricity sector is going to change over the next few years. Slide 2: The comparison between economic growth and energy efficiency. Each color represents a country or region. As economies get richer, growth requires less power.It is difficult to really analyse underlying trends in this chart. As can be seen, even Canada is becoming more energy efficient as its GDP per capita increases. A better higher resolution graphic is at Bloomberg New Energy Finance somewhere at the BNEF new energy outlook. I could not find it. It may be available only for subscribers. One of the most common images that are being used to characterize the rise of carbon pricing, whether it be cap and trade and/or carbon tax is one which shows the number of countries with some form of carbon pricing. Here is a map of the status of emission trading systems that I created for a client in 2011-12. 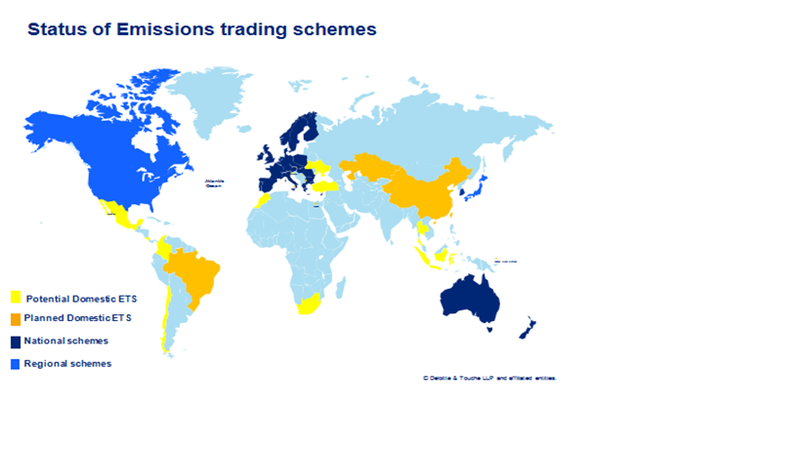 Here, the light blue color indicates no emission trading systems and yellow and orange are planned systems. The following map is from some analysis done by the World Bank in 2015 with carbon markets now valued at 50 billion, much of the yellow and orange now being implemented and with additional countries now planning carbon pricing. Do you like this headline? Well it is all to let you know that the comedy contest being hosted by the University of Colorado has extended its deadline to March 8th. One more week to get your entries in. Humor is a tool underutilized in the area of climate change; yet comedy has power to effectively connect people, information, ideas, and new ways of thinking/acting. In this call, we seek to harness the powers of climate comedy through compelling, resonant and meaningful VIDEOS – up to 4 minutes in length – to meet people where they are, and open them up to new and creative engagement. The winning entry will receive a cash prize, and be shown during the upcoming ‘Stand Up for Climate: An Experiment with Creative Climate Comedy’ night on March 17 at 7:30pm on the University of Colorado campus in Boulder, Colorado. The event will feature a range of comedic approaches, including standup comedy, sketch and situational comedy, and improv. The primary audience will be University students along with members of the community in Boulder, Colorado (no age restrictions will be in place). AWARD CRITERIA: Successful entries will have found the funny while relating to climate change issues. Each entry will be reviewed by a committee composed of students, faculty and graduate students at CU-Boulder. E. a 100-word description of the work. Aerialist, Dancer, Choreographer and Teacher Artistic Director and Founder/DKG Dance Entertainment Coordinator and Performer/Frequent Flyers Productions, Inc.
Last call for climate change comedy hour! Hello all, I came across this video contest, already blogged about here. The deadline is coming soon – March 1st, submit on a leap day and see if you can make something funny about it! REMINDER the deadline is Tuesday, March 1st and we are so looking forward to receiving your entries!! The event will feature a range of comedic approaches, including stand up comedy, sketch and situational comedy, and improv. This project acknowledges that, to varying degrees, we are all implicated in, part of, and responsible for greenhouse gas emissions into the atmosphere. We treat this ‘greenhouse’ as a living laboratory, an intentional place for growing new ideas and evaluating possibilities to confront climate change through a range of mitigation and adaptation strategies. Our project is also associated with the Spring 2016 ‘creative climate communications’ course (ENVS3173/THTR4173) at CU-Boulder. Did you hear the one about when the glacier and the rabbi went into the bar, well the rabbi was talking, the glacier melted away and did not make it! Why did the chicken cross the road? Well, with a carbon tax, there were no more cars, so he did not actually cross the road, he lived on it! Is climate change funny, are you a comedian? So far i have posted on the themes of imagination, the artist and imagining what the future could be and using the power of the human imagination to create a world where humanity addresses climate change. This has included the visual as well as one play. I have also been reading some clifi – climate fiction, although not yet posted about any of it. The other day i got an email based on the list serve that i am part of about a contest hosted by the University of Colorado on climate change and comedy. Here are the details – If you think you can do it- go for it and if you can think of good jokes, send them my way! 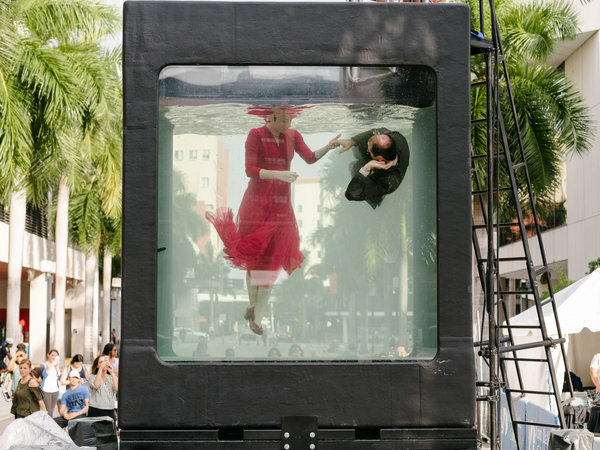 Some more images of climate change and art – this time not from COP21 but from an event taking place in Miami called Art Basel. I did see a tweet from Ed Burtynsky who i already did a blog about who is also down in Art Basel. I became aware of this latest entry in the climate change art encyclopaedia (if I can call it that) from one of the many followers (ha!) of this blog (Thanks Martin). As part of this blog’s continuing effort to support the cultural shift that I feel is needed for humanity to really change what we do, and our expectations, here is video making fun / satire of the Koch brothers. If you want to perform your own version of the song and possibly get a viral hit, grist has the vocals here. Of course, for those of a certain age, it is obvious that this is satire of the “We are the World” video series. Here is the original.. I think I will be checking out the people who have produced this as well “Funny or Die” and see if they have any other videos! And of course the version done by Canadian musicians, called Tears not not enough!. Enjoy! With COP21 ongoing and non-stop climate news and announcements as well as the fact that I am continually uncovering more attempts of creating art to engage people in the story of climate change. The Toronto Star had an article about a melting polar bear which was created out of ice and allowed to melt over the course of time that COP 21 was being hosted. 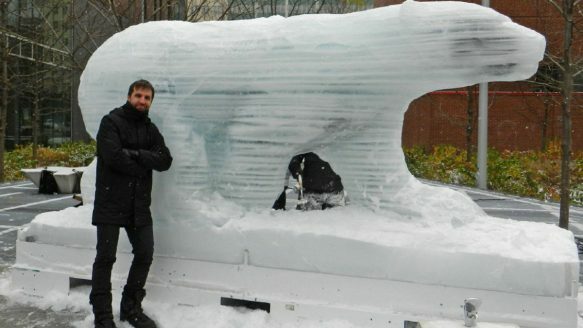 The polar bear ice sculpture is part of the action that the environmental group Equiterre is doing. Lucky you if you want to go see it, you do not have to travel all the way to Paris to see it since it is in Montreal….but you better go fast as it is also melting faster than expected. Fitting as well since Miami and Florida are one of the coast lines most at risk to rising sea levels from climate change. I remember going to a conference on emissions trading in air pollution and staying at a new Trump hotel which had just been built in Florida about 100 m from the beach in the early 2000’s and thinking, has no-one here heard about climate change. Maybe all the capitalists think that they will be bailed out by government money when the sea rises or maybe they only need the hotel and tourism sector to last for 20 years to make their money back. Here is a set of images from Lars Jan and his website. Holoscenes, a performance and installation piece by artist Lars Jan, at Miami Dade College, in Miami. 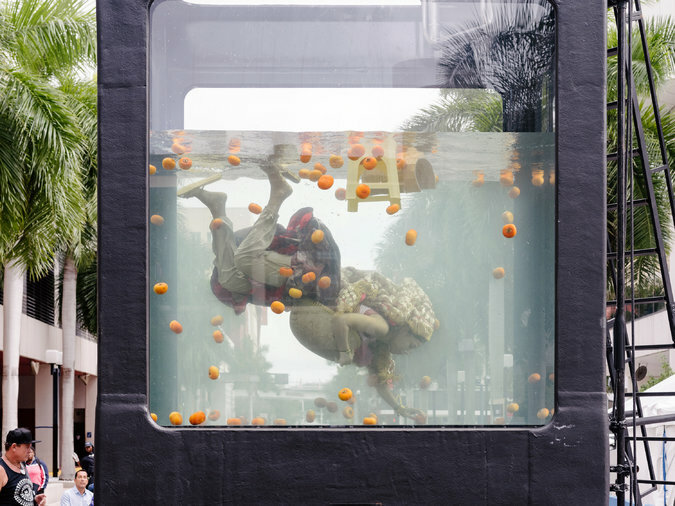 A couple engaged in a duet as an aquarium fills and empties unpredictably, over and over, to symbolize the uncontrollable nature of climate change. With COP 21 going on right in Paris, all of the wires, social media feeds and email user groups are firing at all cylinders with all of the announcements and press releases around what everyone is doing on climate change. I thought I should contribute. I am most certainly torn in many ways. While policies and carbon pricing is needed to internalize all of the costs, a part of me still thinks that we actually need a cultural reset about our society and how we live. Let me use just one example, if all of the cars are replaced with electric vehicles – will that solve the greenhouse gas emissions from vehicles. Well no, then we need to ensure that all of the power plants are not using fossil fuels and what about all of the new power plants and other electricity generating facilities that will have to be built, will they all be solar power and wind – I suppose they could be. Then think of all of the energy and mining and disposal that has to go into the manufacture and recycling . repurposing of that technology. Maybe given enough time and human ingenuity and price increases, all of these issues can be solved with a technological fix, but in the next 30 years, I do not see that happening. 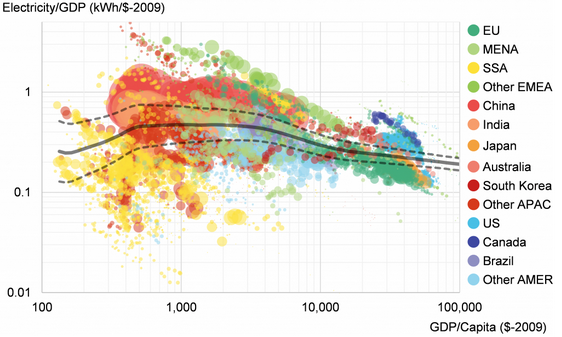 I do try to describe one view of getting to a low carbon future in this previous blog post. I have strayed from the intent of my blog today. I mentioned that i was going to try and highlight the artistic perspectives on climate change. As I mentioned many times already, I was not seeing much and as soon as I started looking, I was seeing more and more. To return to COP 21, apparently there a bunch of fake ads going up in Paris be created by street artists with themes focussed on climate change all organized by Brandalism. One of these is illustrating the extent of corporate involvement in COP 21, when corporations are often seen as one of the barriers to action and change. Sure they will embrace incremental change, but we may need more than incremental change to actually address the climate change problem. Then of course, as soon as they were up, the ad company who was also a sponsor of COP21 was taking them down. Here is the article from Fastco.